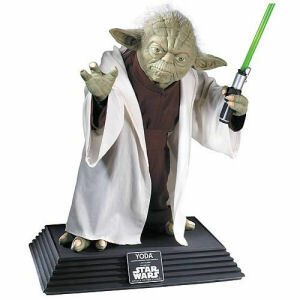 Be sure to get your Star Wars Yoda Replica Life-Size Statue hot of the truck! Fill in the Notify me when Available and you will be the first on your block to have a Star Wars Yoda Replica Life-Size Statue !! From the Star Wars collection by Rubies. Star Wars Yoda Replica Life-Size Statue. Life-size Yoda Statue stands 26-inches tall and looks and feels like the real thing. Rubies Star Wars Action Figures shipping from Canada. No Surprise Border fees or Customs!